A huge part of the 2015 Stanley Cup Final has been the battle between 2013 Cup winner Corey Crawford of the Chicago Blackhawks and Ben Bishop of the Tampa Bay Lightning. NHL.com scouted the goalies before the series and will track their performances each game, identifying attack trends and shot quality. Kevin Woodley, managing editor of InGoal Magazine, will use Double Blue Sports Analytics software to chart goals and shots in each game. 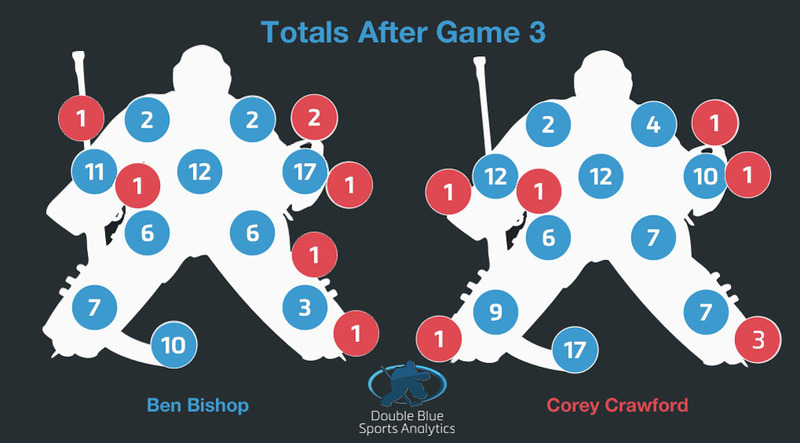 Here are his findings from Game 3, a 3-2 victory by the Lightning. Ben Bishop stole the spotlight and the headlines in Game 3 on Monday by overcoming an apparent injury to make 36 saves to lead the Tampa Bay Lightning to a 2-1 series lead in the best-of-7 Stanley Cup Final against the Chicago Blackhawks. 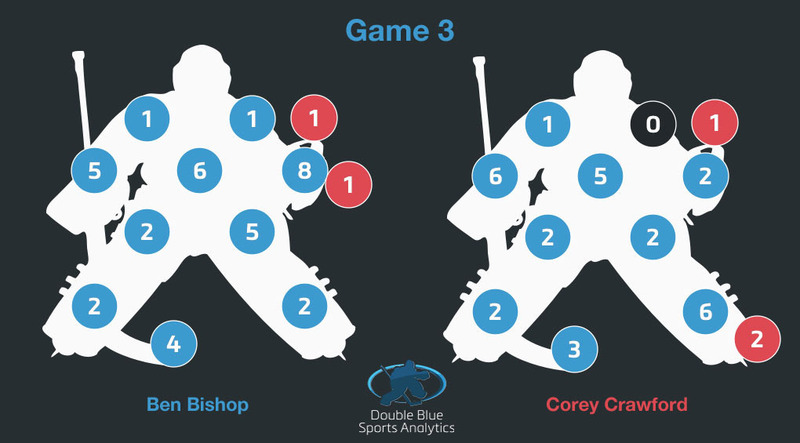 As gutsy as Bishop's effort was while facing the most shots in this series so far, especially during a 19-shot barrage in the first period, the shot metrics tell a different story in terms of quality. Not to take away from Bishop's gritty performance, which included facing six shots from the edge of his crease, but given how he labored laterally at times it's hard to think the Blackhawks didn't want to test his east-west mobility more. 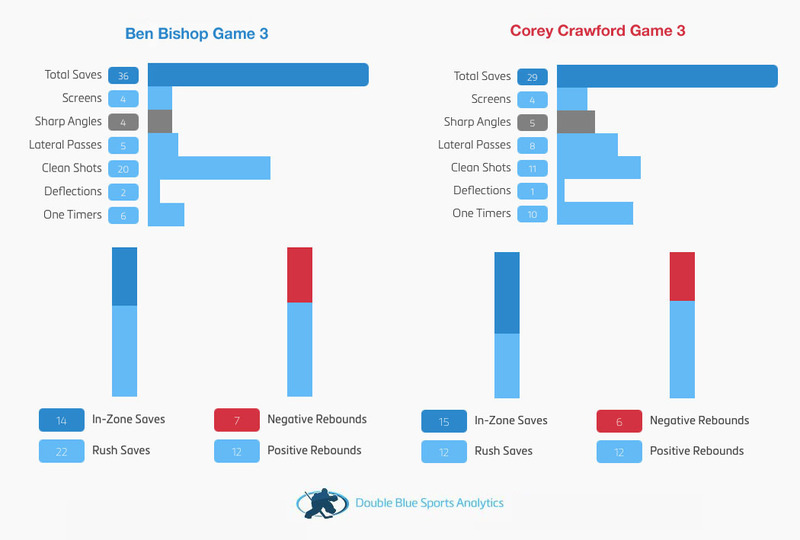 That said, it wasn't an easy night for Bishop, especially early; but Bishop faced five shots directly off lateral passes, compared to eight in Game 3 for Crawford, including the late game-winning goal by Cedric Paquette. The pre-scout on Bishop most often focuses on making him move his 6-foot-7 frame from side to side at the best of times. It's hard to imagine Chicago didn't want to generate more lateral chances given all the questions surrounding Bishop's potential injury. Two of the lateral rebounds the Blackhawks did create on Bishop, who controlled 12 of the 19 rebounds, led to great scoring chances but Chicago's shooters missed mostly empty nets. Bishop did make his best save on a tough cross-ice play, however, by staying deeper in his crease than usual and shortening the distance travelled to turn aside a great chance for Brandon Saad after a nice pass from Marian Hossa on the rush. That was one of three chances Bishop faced which crossed the Royal Road, an imaginary line splitting the offensive zone below the top of the faceoff circles. Introduced by former NHL goalie and current MSG Network analyst Steve Valiquette, the Royal Road helps identify the toughest scoring chances because shots from that area force a goaltender to turn and reset his angle. Saad scored the go-ahead goal in the third period on one of the other Royal Road chances. 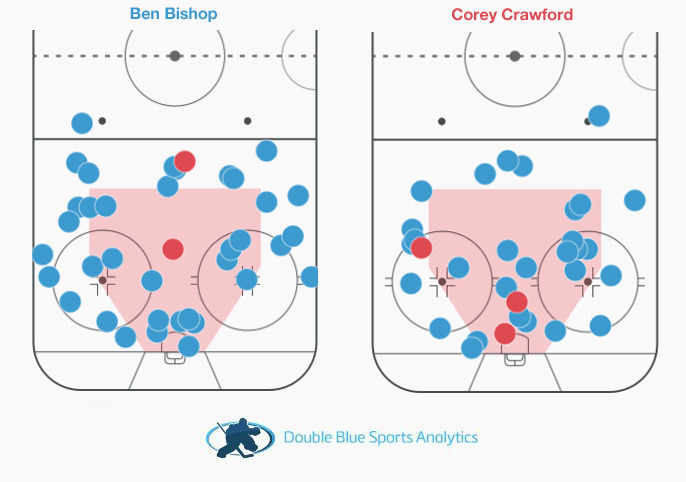 More than half the shots Bishop faced were clean looks (20) while only 11 of the 32 shots faced by Crawford were clean. Also, 19 of the 38 shots Bishop faced came from outside the "home plate" area which extends from the edge of the crease to the faceoff dots and up to the top of the circles. Bishop also stayed deeper than usual on an Antoine Vermette breakaway, again minimizing his movement and making an easy save when the Chicago forward tried to open up the five-hole with a quick deke to the backhand while cutting across the crease. At the other end, Crawford continued to struggle with his post play. After allowing a couple of dead-angle goals earlier in the Stanley Cup Playoffs, Crawford's struggles in this area are well-documented. He was beaten from below the goal line in Game 2 and the way he handled sharp-angle plays on the last two goals of Game 3 were a factor. It's little wonder the Lightning fired five sharp-angle shots at Crawford in Game 3. Forget where to shoot on the Chicago goalie, it's where you are shooting from which seems to matter more right now. Tampa Bay's tying goal 13 seconds after Saad gave Chicago a third-period lead came after a rebound off a shot from Nikita Kucherov from the goal line. Instead of using the reverse VH post-integration technique, which has caused him problems in the playoffs already, Crawford stopped the Kucherov attempt in a traditional butterfly position, which forced the original shot to remain in front rather than keeping it at the side of the net, something reverse-VH is designed to do. It left just enough room for Ondrej Palat to bang in the rebound as Crawford drifted off a post he never really sealed. The winning goal never did get all the way to the goal line before Tampa Bay defenseman Victor Hedman made a great pass out to Paquette in front of the net. Yet Crawford appeared to be going down into reverse VH position on his short-side post as the pass went back the other way. Though the lack of defensive help played a big role in Paquette being able to tap it in, Crawford didn't give himself a chance on a puck that went in along the ice into the middle of the net. While the Lightning try to exploit Crawford's post-play problems, the Blackhawks might be targeting Bishop's glove hand. The first-period power-play goal from Brad Richards went in off the tip of Bishop's glove, something fans have seen before in these playoffs. Saad ripped his one-timer past Bishop on the glove side too as Chicago directed 11 shots in the mid-to high glove range compared to six on the blocker side. In the series, Chicago has fired 22 of 83 shots in the mid-to-high glove range compared to 15 on the blocker side, so it's still early to declare any kind of obvious intent by Chicago other than trying to score where you traditionally would on any butterfly goalie. The bigger concern for the Blackhawks will be making Bishop move more in Game 4. Bishop played the puck four times in Game 3 compared to 19 in Game 1 and 13 before leaving Game 2 in the third period, so his lack of activity behind his own net may have been the biggest sign something was wrong. Looking at the shot metrics from Game 3, it's hard to argue the Blackhawks did enough to properly test that theory.